The lateral compartment of the lower leg is made up of the peroneus brevis and peroneus longus muscles, either of which can be the cause of a compartment syndrome. Compartments syndromes are either acute or chronic. Acute compartment syndrome is one that comes on suddenly and a chronic compartment syndrome has usually come on gradually over time. Acute compartment syndrome can occur due to an impact or injury which causes bleeding and swelling within the muscle sheath. 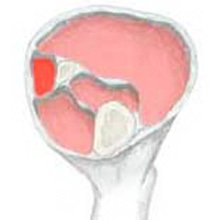 The extra fluid causes too much pressure within the muscle sheath. Symptoms include pain at the back of the leg, especially when walking or running and a swelling or tenderness in the muscle on the outside of the calf. If it is particularly painful then seek professional medical advice. Acute compartment syndrome can be a medical emergency as muscle and nerve damage can occur. Rest until the ain has gone. Work the upper body instead or swim if this can be done pain-free. Apply ice or cold therapy for 20 minutes every two hours. Ice should not be applied directly to the skin but wrap in a wet tea towel. 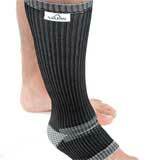 Wearing compression support may also help reduce the swelling and support the muscle. A professional therapist can perform compartment pressure tests and confirm the diagnosis. They may apply ultrasound or other electrotherapy techniques to help swelling dissipate. A doctor may prescribe anti-inflammatory drugs such as ibuprofen to reduce pain and inflammation. In severe cases, a surgeon can operate to surgically decompress the compartment. Compartment syndrome mainly occurs in runners and comes on because the muscle has grown too big too quickly for the sheath that surrounds it. Symptoms include pain which gradually comes on during a run, getting worse until it is impossible to continue. After a period of rest, the pain disappears only to come back when the athlete tries to run again. The causes of this can be training too much too quickly but you can also be more prone to this if you have laxity in your ankle ligaments for example after severe or recurrent ankle sprains. Biomechanical problems of the foot such as overpronation or over supination may also contribute to the load on the muscle increasing the chance of a chronic compartment syndrome. Rest until the pain has gone. See a specialist to confirm your problem as the injury may just be a chronic muscle strain that has not been allowed to heal properly. If compartment syndrome is diagnosed then an extended period of rest in conjunction with correction of foot biomechanics may be required to allow the overdeveloped muscle to atrophy and the sheath to accommodate it. What can a specialist or doctor do? A doctor may prescribe anti-inflammatory medication such as ibuprofen. Sports massage techniques to stretch the muscle sheath may have some success. 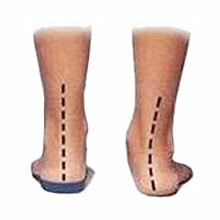 Cross friction massage applied to the sheath may help stretch it and allow more room for the muscle within to function. In persistent or severe cases the best solution is usually to operate by releasing the sheath and allowing the muscle to expand naturally.